It is with great excitement that we announce that Alyssa and Ania Splain You a Thing is joining the orbit. You can find us at http://the-orbit.net/splainyouathing/. We can’t wait to see you there! We are extremely excited to be joining up with such amazing activists and writers and hope you will take a moment to explore all the talent this network has to offer. Don’t worry, we haven’t abandoned Burning Bridges either. Stay tuned to our Facebook page for more information as we work towards launching our site and our publishing house. At the beginning of October, Alyssa and I moved from our old apartment, to a new one. There were a lot of reasons why we decided to do so. Main among them was the continuing declining quality of the building we lived in. When we first moved is, the building was well maintained. There was a tenant run library where many neighbours would congregate. We knew our neighbours, something I had never had happen in an apartment building. Over the years however, the frequently changing property managers and rental agents, some of who were not well disposed to running a building of that size, led to things being dropped. The tenant library was closed, first we were told it was temporary, but finally it was revealed that it would in fact be permanent. We ended up with a mold problem in our unit, and rather than dealing with it, the managers tried to blame us. During this time, I learned that the whole building was experiencing problems with black coloured mold spots in their units. Despite this, we were still blamed for its presence in our apartment. We finally had to hire a professional who was able to identify that the problem was systemic and not a result of anything we had done. While the professionals were there, they measured the air quality levels. Their machine detects dust, mold, and pollen particles in the air. A level of between 200 and 600 thousand was ok. The level in our building was seven million. While living in that building, I dealt with increasingly worse allergies, and now I knew why. When we finally moved out and I came back a week later to clean, I had my first asthma episode since I was 12. I’m on puffers again, after having previously outgrown asthma. We were really excited for our move. Because the location was further from downtown, we were able to scrimp up for a 2 bedroom apartment. Finally I could set up an office and maybe use that fact to help motivate me to focus better. Our new community also offers some great amenities, including more accessible recycling, community gardens, and so forth. Thanks to the generosity of friends, as well as a credit card, we were able to hire movers. Something we were excited for, since my disability makes it difficult, even dangerous for me to lift heavy items. Alyssa also has been dealing with enough, that the prospect of heavy lifting was extremely daunting. The movers would help make the whole situation less stressful. Little did we know, our choice of moving company would turn this whole experience into the move from hell. To start with, the whole move took over 16 hours, spread over two days, and wasn’t even done at the end. I still don’t understand how they managed to drag it out that long. After almost 8 hours of moving out the apartment, the truck was half empty, and yet we were being told that they would have to charge us a second truck fee. Why? Because they had packed the pantry first, putting bags of food at the bottom back of the truck. They couldn’t put anything on top of it or it would be destroyed. When they finally arrived the next day to continue the move, it turned out our lift-top table, the one piece of furniture I splurged on when I finally received disability, had been stolen. Along with everything that had been stored inside it. That wasn’t the only thing we lost. In the end we were missing my office chair, as well as Alyssa’s jewelry box, as well as some miscellaneous items. They made Alyssa carry items, so that we could “save money”. That first day, she didn’t sit once for over 8 hours. The move took so long, that we missed both breakfast and lunch, having expected to go to Tim Hortons on the drive between apartments. I too ended up having to move more than I should have health wise. During the second day of the move, they refused to start until I paid for the day before. Clever, since I had no intention of paying that much for what was clearly an incompetent move. Still, I needed to get my move finished. After some negotiation, we agreed that I would pay for 9 hours, total. What followed the transaction going through was a completely expected, but still exasperating, flaking out on work. One of the movers was apparently so sick, that he had to stop working. I took him at face value. Since they were saying he needed to go to the hospital, I offered to drive so they wouldn’t have to take the truck. Imagine my surprise when they insisted that it was ok, they would finish unpacking the truck with what they had packed first. They left with a half empty truck, leaving behind several items in the public hallways as well as all over the floor. By the time it was all done, Alyssa and I were so exhausted we could barely function. I spent most of October with severe spinal pain. I could barely walk all month. The stress made my Crohn’s flare. We’re still not completely unpacked, though we are getting a bit more done every day. I can’t wait till we are finally settled and things can get back to normal. Needless to say, neither of us have any interest in moving for a very, very long time. We Will Light the Way With the Bridges We Burn! It is with great excitement and eagerness that I would like to announce that Alex and Ania Splain You a Thing will be joining a new blog network! For the last several months both Alex and I have belonged to a support group of women and non-binary folk. This is a group of people devoted to an intersectional pursuit of social justice. Our frequent discussions have led to the creation of several posts and other media. Much of our group falls into different spheres of oppression, and like many in these spheres, a significant portion of us have also had difficulty maintaining gainful employment. For some, it is various disabilities that get in the way. For others, prejudice plays a role in minimizing the opportunities available in a struggling economy. Determined to improve our situation, while also interested creating a space that would discuss different issues and dreaming of having our own publishing house inspired by a social justice approach to literature, we decided to start Burning Bridges. What makes our network unique? For one thing, all our writers and content creators are women and/or non-binary folk. While we acknowledge that there are some good male writers out there, we want to highlight voices that are not always given priority in public settings. Our writers come from very diverse backgrounds. By combining such different perspectives, we hope to encourage discussion of how the various spheres of oppression often intersect. To look at how any given issue can actually exist along different planes of oppression. Some of our writers are parents, single or otherwise, some are or have recently been homeless, many live in different levels of poverty, they have diverse disabilities, both cognitive, physical, and mental, both visible and invisible, many are obsessed with cats, or dogs, or even fish. Many of our content creators do not exist along binary gender lines, some are transgender, they belong to different races, with different educational backgrounds. Some are atheist, some are Christian, others are Muslim, but all of them believe in a multi-intersectional approach to issues that can affect any one of us. We are looking to offer multimedia services to cater to diverse preferences. Some of our content creators are artists, others are looking to develop regular web comics that focus on various issues. Many of our contributors are interested in starting or redeveloping existing podcasts and video casts. Many are interested in some combination of different styles in addition to their on-going writing. It’s not just for the non-fiction enthusiast. Many of our writers are also accomplished fiction writers. Social justice doesn’t just stop at the real world. We believe in highlighting characters in minority populations, whether people of colours, disabled, trans, queer, or non-male. We would love to help promote writing that explores various issues through the lens of fiction, whether speculative science fiction, fantasy world building, myths, poetry, short stories, or any of the various possibilities out there. The blog network is just a foundation and stepping stone for the creation of Burning Bridges Publishing: a start-up press with a mandate towards promoting writing through a social justice lens. I personally would love to see about publishing anthologies of stories on individual matters likes race, disability, poverty. I would love to see more new and emerging writers see a chance at being published. I would love to highlight stories written by those in the same circumstances. I would love eventually to open spaces for at risk youth, whether in difficult neighbourhoods, or youth who are LGBT, where they can explore their creative voices in different media. This is a dream that I would really love to see happen, but we need your help. We need investors to help get us off the ground. To make sure that we can offer a great product off the ground. Please donate what you can, and if you cannot, please share it widely. Together we can make this dream a reality. 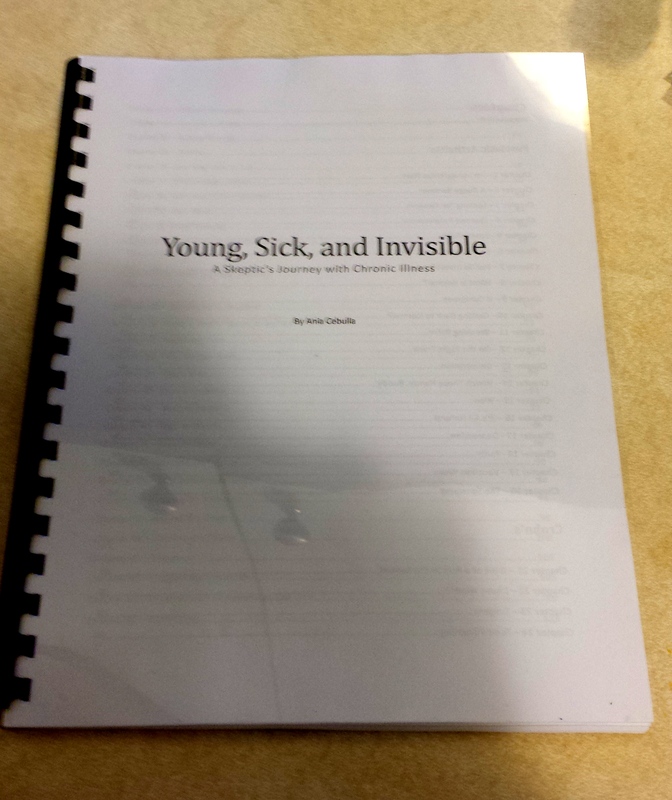 Earlier this week, I finally managed to finish editing my book Young, Sick, and Invisible: A Skeptic’s Journey with Chronic Illness. What does this mean? It means I have successfully written a book! It means that now I have a product that is ready to start being sent out to potential publishers in the hopes that I can find someone who wants to turn this into a real book. It means that I managed to prove to myself, and other’s who said that I couldn’t, that this is a thing I can do. That this is a thing I’ve done. I can call myself a writer without question now. This on the heals of submitting my first short story for publishing earlier this year. It might not seem like something that I would need to prove to myself, but self-doubt is something I’ve lived with for a long time. There is a voice in my head that tells me that I cannot do this, that I never finish anything, and it is a voice I recognize from my life. A Hard Copy of my book, just for me to hold. It’s so pretty. It has words and those words are mine! My words!